Can I use the 3.3% in a hose end sprayer and at what rate? My applicator on the bottle fell and cracked. No, Image Herbicide has to be mixed exactly as the label instructions direct you to mix it. There is no way to do this with a hose end sprayer as this is a Ready to Spray product and is not diluted. Basically, you can spray this with a regular sprayer over 8,000 square feet without water. Water is only the carrier, not a dilution. The best time to treat these weeds are during the early warm growing season. Depending on where you live it may be too early to spray. Typically, the grass has 3-4 small blades and is actively growing. Using a surfactant or a few drops of dish soap also helps to allow it to stick to the grass blades. Nutsedge is difficult to control. I have found extremely good results on my personal yard with a product called Certainty. 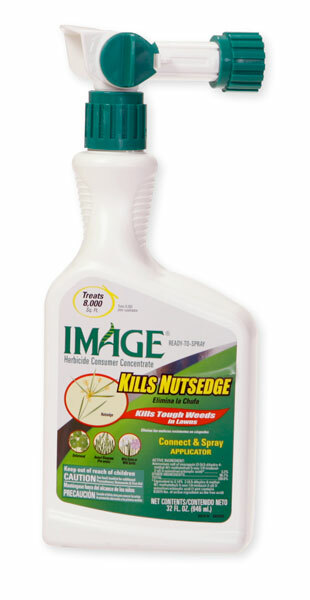 Image is a good product, but in extreme nutsedge or nutgrass infestations, you may need some professional quality herbicide.